Toronto, ON MC K-os has been busy promoting his latest album, Yes!, just last week releasing a new video for the track "Zambony." Now, the rapper is already getting ready to roll out his next release, announcing that his new Anchorman Mixtape will be available August 6. The mixtape will be digital-only and will be posted here for a limited time come release day. 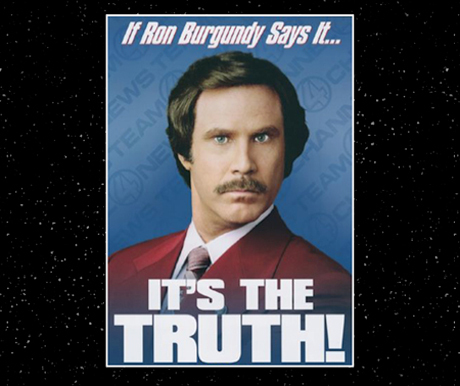 The website features a picture of Will Ferrell as Ron Burgundy, just in case you were wondering where Anchorman Mixtape got its name. Following this initial mixtape release, the ten tracks will come out as digital double A-side singles, with each release featuring bonus content and at least one video. A press release calls this release style the "Motown Model" because "it's a modern K-os twist to the Motown Records model of issuing 45-inch vinyl singles in the '60s." This new model comes a few months after K-os expressed his disillusionment with the LP. The first of the digital singles is due in late August and will bring together the tracks "Faith" and "BlackWater." The former is a collaboration with fellow Canadian rap sensation Drake, while the latter features former Death From Above 1979 drummer/vocalist Sebastien Grainger. K-os will be releasing a video for "BlackWater," which was inspired by his recent visit to the Gulf Coast. While on tour, he filmed a mini-documentary about the oil spill. All proceeds from the single will go to Alabama's Mobile Baykeeper group, an environmental organization. "BlackWater" will also appear on the David Suzuki Foundation's Playlist for the Planet, an environmental CD due out via Universal in October. Expect North American tour dates to be announced soon. 8. "Beauty Is A Loaded Gun"
9. "I Wish I Could Believe"
10. "Dance In Your Car"
K-os Returns with New Single "No Bucks"